If Bambi lives in your neighborhood, he might eat your tomatoes for dinner before you get a chance to enjoy this summer fruit. Deer are common garden pests in many parts of the United States. They’re cute, with those big, brown eyes, but you’ll want to find humane ways of keeping them out of your garden if you don’t want to share your harvest with these woodland creatures that come in search of food at night. Use a repellent spray product on your tomato plants and other plants growing near them. Deer don’t like the smell of certain odiferous substances, such as old eggs and coyote urine. Repellent products are safe to use in your vegetable garden, according to the manufacturer of Deer Away repellent. Install a standard fence that is at least 8 feet tall or an electric fence with wire up to 8 feet from the ground. If you choose an electric fence, install several parallel wires from ground level to the 8-foot mark to prevent deer from sneaking in between the wires. You only need to turn on the electricity at night. If you don’t want an electric fence, install a standard fence made from chain link or heavy gauge wire. All types of fences must be 8 feet tall or more because deer are good jumpers. Encircle each tomato plant with heavy gauge wire such as hog wire if your budget doesn’t include fencing your entire garden. Purchase narrow-gauge wire so deer cannot poke their heads through your wire fence, and make the “cages” tall enough and large enough so the deer can’t reach tomatoes growing high on the vine or fruit that could be sticking through the openings in the wire. Try laying wire fencing on the ground around the border of your garden where your tomatoes live. 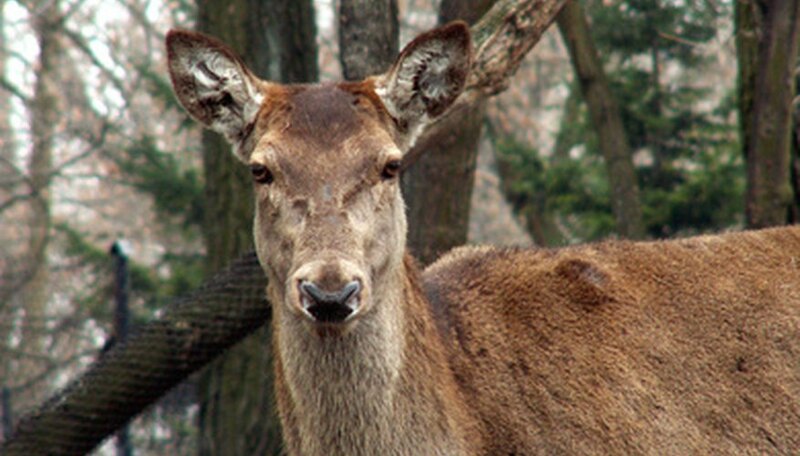 Deer don’t like the feel of wire on their hooves, so they don’t usually tread over areas where wire covers the ground. Purchase an ultrasonic product designed to keep deer away by emitting an annoying noise. Try each of these methods one by one until you find one that effectively keeps the problem deer away from your tomatoes. Do not shoot deer. Doing so can be dangerous and might be prohibited, especially if you live in a residential neighborhood.